I went to the Florida Institute of Technology for one semester only, and while there I was the coxswain for the crew team. 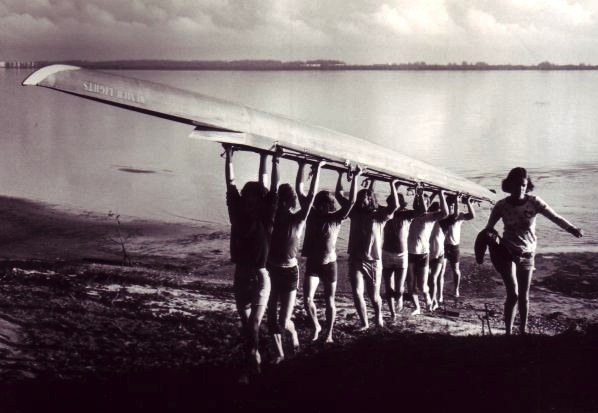 We’d get up before dawn to go for a run and then row on the Indian River. I also discovered and learned about bioluminescence. The water in the river would light up around you as you waded out with the shell. I’ve never seen it anywhere else since, but that effect was magical. The whole place was magical: orange groves, the sparkling river, that magnificent mansion being taken over with spanish moss. But most of all I also discovered that the hour just dawn is the most enchanting time of the day. It has that particular stillness, but also the sense that everything is about to happen. A local newspaper did a piece about the crew team. This is us coming up out of the water out of after practice. I’m out of the picture, sitting to the left of this guy. 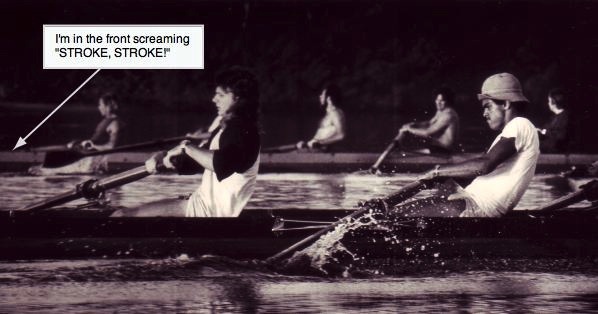 I felt bad because I was a terrible coxswain, and I didn’t yet accept that some things you’re good at, others, not so much. I barely accept that now! But it stung because the thing I wasn’t good at was leading and motivating the team. The other coxswain was amazing at it. She not only got them to work harder, they had more fun doing it!